Throughout 2018 the Tri-County Board has marked its 50th year serving the people of Miami, Darke and Shelby Counties. The roots of the Board can be traced much earlier, but we became a truly Tri-County Board in the Autumn of 1968, when Shelby County and Darke County Commissioners appointed members to join the Miami County Board of Mental Health and Mental Retardation, which had formed in November 1967 in response to Ohio House Bill 648 establishing community-based mental health boards, then called "648 boards." 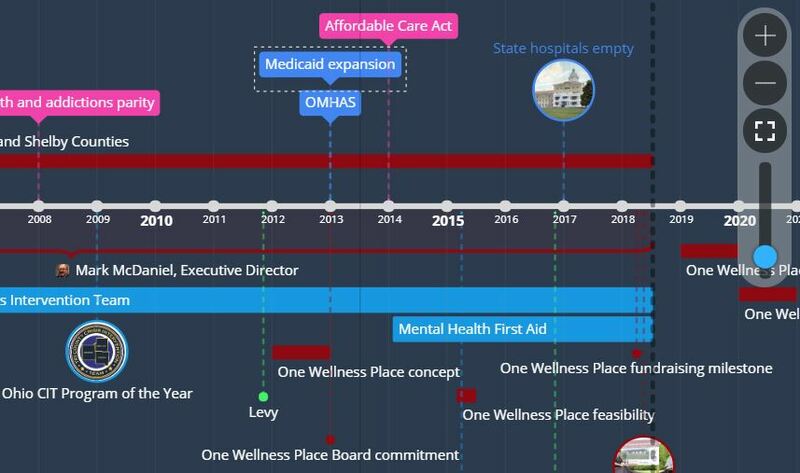 The interactive timeline linked below allows for the exploration of the major milestones in the development of community behavioral health systems and the evolving role of the Board in overseeing that system. Key to the success of the Board has been the dedication of its volunteer Board members that represent the counties, communities and constituent groups the Tri-County Board serves. An interactive timeline of Board terms visually shows the 137 individuals who have served, some briefly, some for more than a decade, to guide the Board in its response to the mental health and addictions needs in our area. In addition, a list of Board members by name is provided. Since 2000, the Tri-County Board has awarded the Geraldine B. Nelson Award to to individuals and groups who demonstrate exceptional advocacy in the realm of mental health and addiction issues. See the full list of recipients, with bios of recipients since 2013.